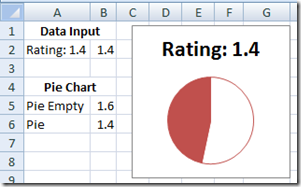 Let’s walk through a few of the features of this chart. 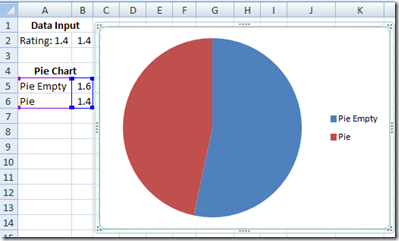 2) Chart dynamically changes the pie slices in cells B5 to B6. 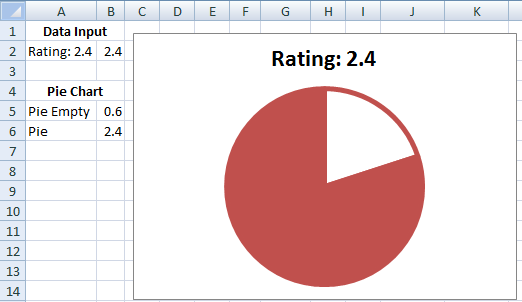 3) The chart also adds the current rating to the Chart Title. 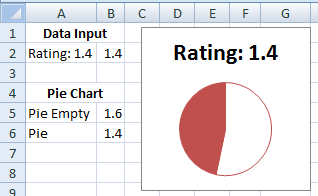 If you want more information about making a Dynamic Chart Title, please go to this link: https://www.exceldashboardtemplates.com/?p=1093. This post also includes step-by-step instructions and a video tutorial. 1) Enter your current rating in cell B2. 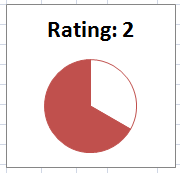 In our case, lets put in 2 so that it will look like the chart at the top of this posting. 3) In cell B6, put in this formula: =3-B5 This will be so that the total is equal to our total rating of 3. 7) Now click on the legend and then press your delete key to remove the legend. 8) In cell A2, create this formula: =”Rating: “&B2 This will be used for the Chart Title. Just what the CEO of your company was asking for in the next Executive Company Dashboard. 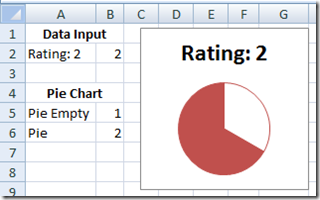 Now as you change the cell B2, it will change your chart for the current rating. I hope this helps you with your next executive excel dashboard. 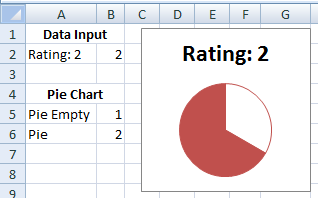 Please let me know if you found this helpful and how you are going to use it in your next dashboard template in the comments below. 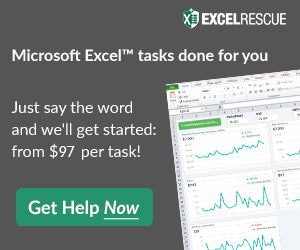 Please don’t forget to Subscribe to my blog so you get the latest excel dashboard design information.